So you want to take your first step into the world of water cooling and you are not sure where to start? Well, lets start right here. 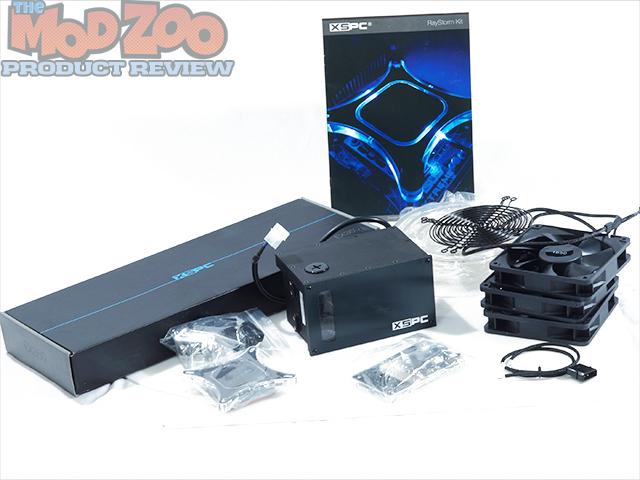 Water cooling kits make a great product for first timers, not just because of their price, but also the fact that they come with everything you need to get started on your first loop. Kits also make a great way of expanding your existing loop. The ability to get all the components in one go saves time and effort, and you know that you have everything needed to get the job done. The RayStorm 750 kit from XS-PC is a perfect example of how great custom loops don’t have to be expensive. At $180.00, the RayStorm 750 EX 360 kit is a great buy, especially when you compare that price to an AIO kit. The biggest benefit of having a custom kit is the quality of components and the ability to expand your cooling loop as needed. The RayStorm 750 EX-360 kit comes with everything you need to run a CPU only loop. The kit comes with the XS-PC RayStorm block with both Intel and AMD mounts, the EX 360 triple radiator, X20 750 Bayres/Pump, G1/4″ to 1/2″ barb fittings, and three(3) XS-PC 1650 RPM fans among other things to get the job done. The kit also comes with a very nice manual, which is nothing less compared to a nice water cooling guide online. So when XS-PC says this kit has everything to get you started, they were not kidding. Well enough of my blabbering, it’s time to get into this review and check out the RayStorm 750 EX 360 Kit.